Happy New Year everyone!! I hope it’s a great one. I’m actually starting off the year doing well..... a blog post yesterday, and another one today. I really fell off the blogging habit last year, badly. I would like for that to be one of the things that I do better this year. We had a fun end to our day yesterday. About half an hour after I finished writing my post yesterday, found here, where I was saying I was sad because Scott and I were sick and we wouldn’t get to see Avery again before he went back home, who should show up at our door than Avery and Noel and Mel. 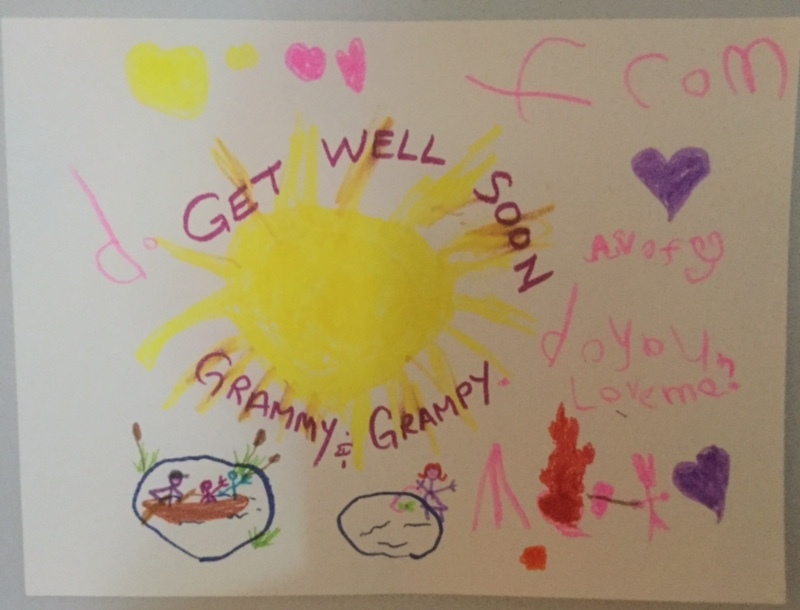 Avery made us up the sweetest get well picture and he brought it to us in person. He sat down with us and explained all the different parts of the picture. The bottom left picture is Avery roasting marshmallows at a campfire. He says he has bunny ears rather than people ears because he doesn’t know how to draw people ears. Beside the campfire is a tent. He said he drew a tent because he didn’t know how to draw our trailer. Then there’s a picture of Mel fishing at a small lake. And the bottom left picture is of Avery and his Daddy, complete with baseball cap, out on a lake in a canoe. He even drew in bull rushes. We are most certainly having a good effect on him when it comes to enjoying the outdoors and camping. We’ll definitely have to make sure we plan some more camping trips with him this year. I am doing some slow hand stitching today. 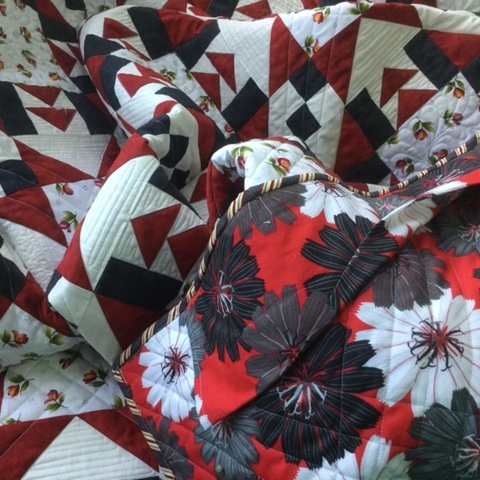 This quilt, Geese Around the Tulip Patch, is almost finished. The binding is done. All that is left is to hand stick down the edge of the hanging sleeve. Once that is done, I can get some decent pictures of it, finish editing the pattern, and it will be ready for release. So very exciting! So, with that in mind, I’ll link up to Kathy’s first Slow Sunday Stitching of the year, and then get stitching on that hanging sleeve. Great backing fabric! That is a wonderful get well card, sure to cure whatever ails you. 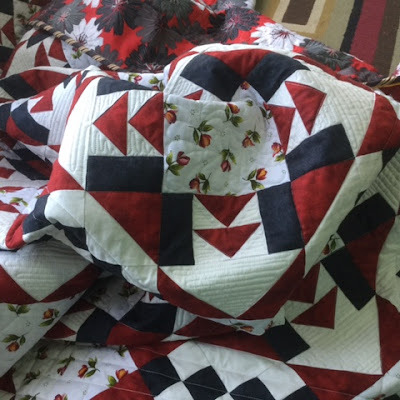 Hope you were able to finish your binding even though you weren't feeling well!